The special designed Bluetooth hands-free car kit adopts advanced capability with professional Bluetooth module and OTG/MP3 decode chip, it can decode music files which you download to SD card and USB flash, and then transit to car audio through FM wireless transmitter. If your mobile phone with Bluetooth function, it can convert to hands free automatically when there is a call. And after communication with caller it will automatically convert back to music mode. 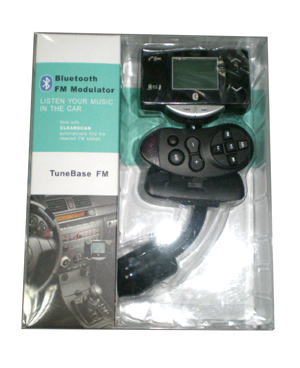 Also it can using wireless transmit MP3 file music from your mobile phone to car stereo sound system. There is no need to change any original device of your car. You may enjoy music on the way during driving and talk over the call in hand free, so entertainment and security along with you on the way. • Excellent sound quality with D.S.P solution for echo cancellation & noise suppression (CVC technology). • Broadcast music stored up (SD/MMC cards) by the automobile through car stereo system.